Do you care for someone diagnosed with Alzheimer’s disease or a related dementia? Are you looking for information and support? You are not alone. 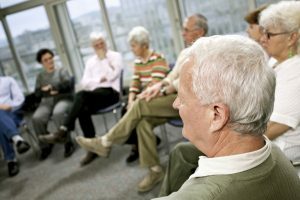 Alzheimer’s Association Caregiver Support Groups provide emotional, educational and social support for family and friends of individuals with Alzheimer’s disease and other, related dementias. As a team that heads its own memory care facility in Vermont, we’re passionate about supporting those who deal with Alzheimer’s in the community—and this is a great place to start. • Share feelings, needs, and concerns in a confidential, supportive, non-threatening and non-judgmental atmosphere. Cedar Hill Continuing Care Community is comprised of Cedar Hill Health Care Center and the Village at Cedar Hill, a family-owned and operated senior community, providing a supportive and comfortable home to seniors in all stages of life. Cedar Hill was founded in 1988 by Mary Louise Sayles, a registered nurse and licensed nursing home administrator with many years of experience in long-term care administration. Mary Louise’s daughter Patricia Horn, who is also a licensed nursing home administrator, is the Community CEO.